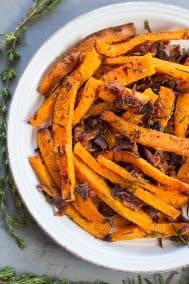 This easy, healthy, sweet and savory maple bacon roasted butternut squash is everything you’re craving! 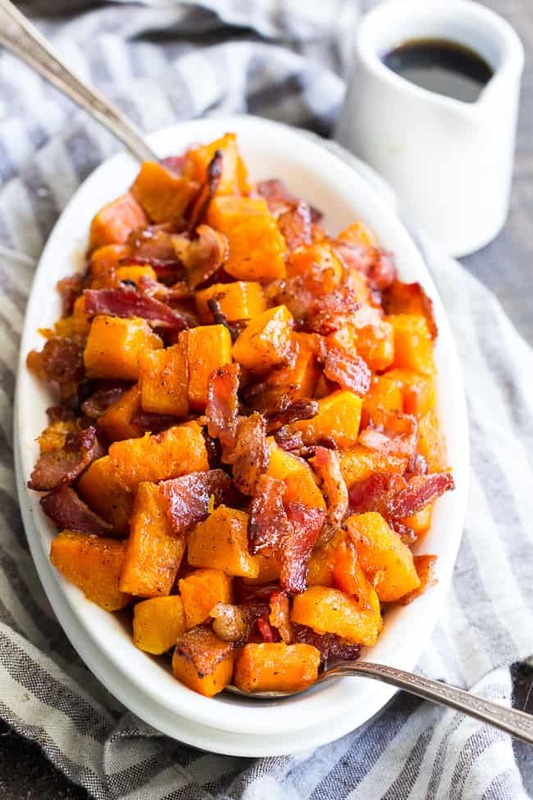 Golden roasted butternut with crisp savory bacon and sweet maple cinnamon make this cozy side dish downright addicting and perfect to go with any meal. Great for the holidays too! Paleo and refined sugar free. I have to apologize, really – make this and you’ll see why. Love at first bite is an understatement with this maple bacon roasted butternut squash. Well, maybe it’s just lust – totally possible – but all I’m saying is that I had to physically force myself to STAY AWAY from this sweet, savory, ADDICTING side dish for the rest of the day after making it. I mean, after I ate half of it, that is, with my hands. I’m telling you, it started so innocently. Really, who would’ve known? I had the sincere intention of creating a super easy side dish recipe for you, that could double as a slightly-fancy holiday side dish, since we’re less than a week from Thanksgiving and all (that jazz). I cubed the butternut. I roasted it (in bacon fat, salt and pepper) for awhile to soften it up before the magic happened. We were still in very familiar territory here – nothing overly exciting just yet. And then? It was time for magic. With the addition of the bacon pieces, maple syrup, and cinnamon, within 10 minutes my plain roasted butternut had turned into everything dreams are made of. Well, food dreams, at least, the best dreams of all. We have all the flavors and textures right here! The bacon is “candied” with the maple cinnamon mixture and the butternut is golden perfection. And when it was all over, I felt like I had barely done any work – that was the best part! 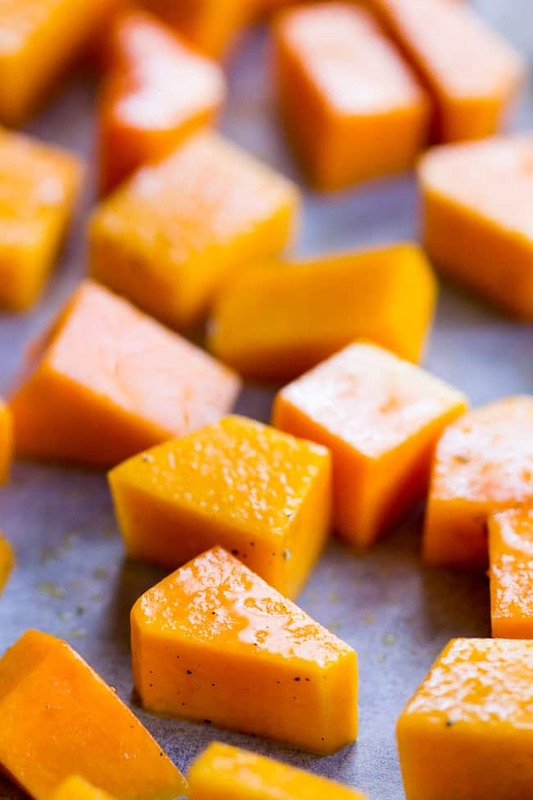 And hey, if you buy your butternut already cubed, you’ll do even less work than I did. Either way, easy side dish success is happening right here! 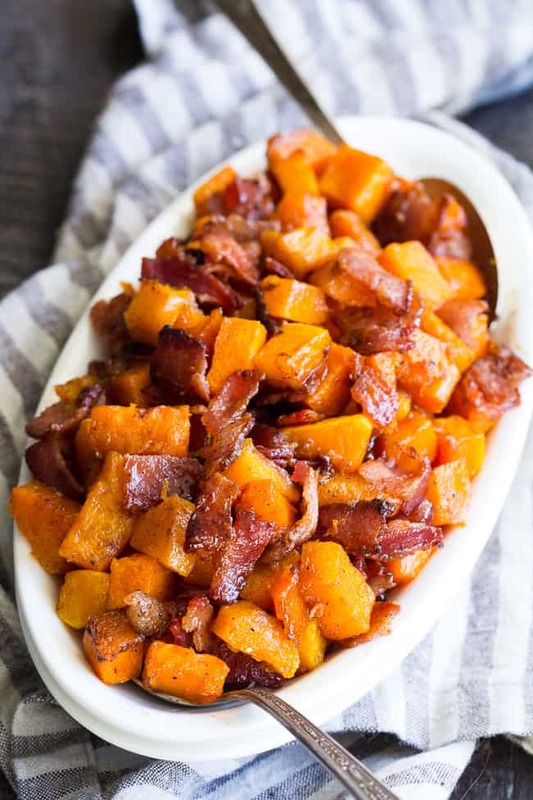 So yes, this maple bacon roasted butternut is “fancy” enough to serve as a holiday side dish, yet simple enough for your everyday meals. Which means? You’ll never have to say goodbye! Serve it for Thanksgiving, Christmas, or a weeknight side with chicken and greens. Or, serve it for breakfast or brunch with crispy fried eggs (and greens, to be extra-healthy.) Honestly, you could even eat this for a snack. Or dessert! It’s a total “anytime you feel like” recipe! Get out your butternut and bacon, preheat your oven and let’s get started. You’re about to fall in love (lust?) with a side dish – yes oh yes! Get ready, let’s go! 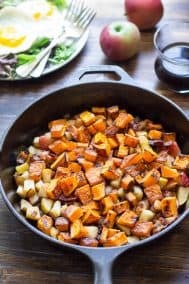 This easy and delicious, sweet and savory maple bacon roasted butternut squash is everything you're craving! 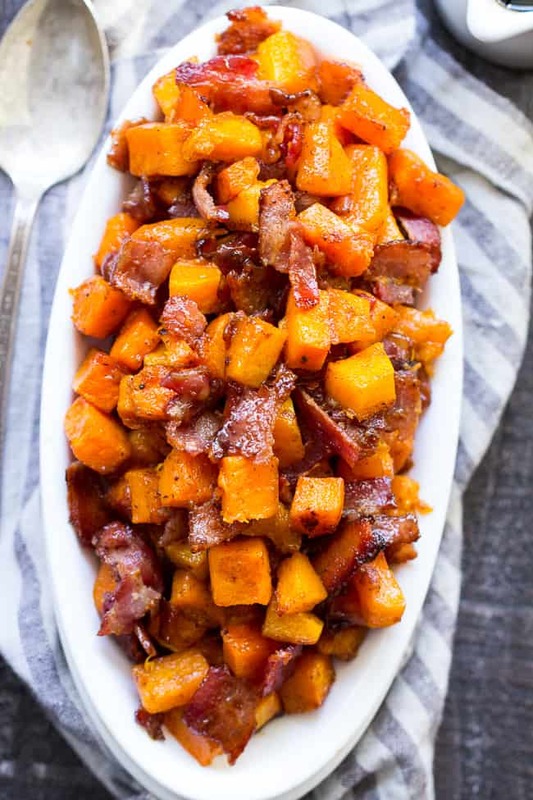 Golden roasted butternut with crisp savory bacon and sweet maple cinnamon make this cozy side dish downright addicting and perfect to go with any meal. Great for the holidays too! Paleo and refined sugar free. If using bacon fat* to roast the squash (optional) cook the bacon first: heat a large heavy skillet over medium high heat and cook bacon until 2/3 of the way done, then remove to drain on paper towels and set aside. Toss butternut squash with 1 1/2 Tbsp of bacon fat (or other cooking fat) and the sea salt and pepper. Arrange in a single layer on the parchment lined baking sheet, and roast for about 25 minutes - until softened but not yet browning. Meanwhile, cut or break the partially cooked bacon into pieces, then whisk together the maple syrup and cinnamon in a small bowl. 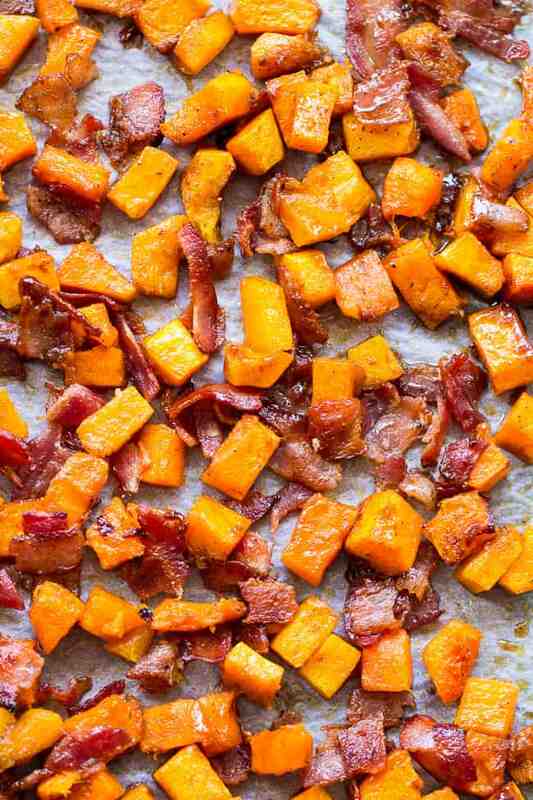 After roasting squash 25 minutes, remove from oven and sprinkle the bacon over the top. 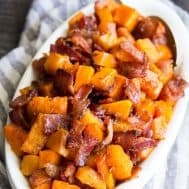 Drizzle the maple syrup/cinnamon mixture evenly over squash and bacon, then very gently stir to combine and rearrange squash and bacon in a single layer. Return to oven and roast for another 10-15 minutes, checking after 10 to make sure the bacon and maple syrup aren’t burning. Once the bacon is crisp and squash is golden brown, remove from oven. Serve warm and enjoy! 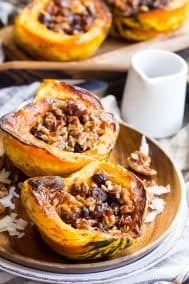 *Using your rendered bacon fat will add about 5 minutes to cooking time since you'll have to wait for the bacon to cook before roasting the squash. Best side ever! This looked so delicious that I had to make it right away. One problem, no butternut squash in the house. I decided to do the same with a sweet potato…DELICIOUS!! And so simple. Love taking simple ingredients and making a masterpiece. Thank you so much. You can definitely do the same with sweet potato! So happy you liked it! I would like to remind your readers that when you buy precut vegetables and fruit they are sprayed with some chemical so they stay looking fresh. I seldom buy anything precut, doesn’t matter that it take a little longer to prepare. Omg this was so good!! We just started eating Paleo last month and this was like a delicious treat!! I added a few pecans on the top with the bacon! My husband and I had to put what little was left away so we’d stop eating it. Thanks for sharing! I always like trying a new dish. This sounded wonderful. I just happened to have the uncured bacon in frig so I made it for guests. Very well received. I was thinking about trying some chipotle seasoning next instead of cinnamon. Easy recipe with very few ingredients. I did love it. Thanks for making it available. This is so good if you put it on top of your head your tongue would beat your brains out trying to get to it. NEVER any left over. SUPER EASY even for an old cowboy. Made this tonight as a side with dinner. I couldn’t.stop.eating.it! Thank you…. delicious!!! I am thinking of starting this a day prior to serving and after cooking for the 25 minutes cool and refrigerate and then the day we will eat it I can add bacon mixture and finish. What are your thoughts on that? I think that will work out fine. Oh wow!! This we delicious! Just made it last night to test it out before Thanksgiving and it was a hit. I’ll make it again to bring to my parent’s house this Thursday and I know they’ll love it! Absolutely delicious. There was nothing left! Love the maple bacon flavor! Good enough for company.